How much do you hate pulling into a great campsite, getting out of your car, and then finding rubbish left there? I really get mad. It’s lazy and disrespectful to other campers and the environment. It’s no wonder free camping sites are closing down all over Australia because of the mess left behind by inconsiderate campers. The blatant disregard shown by these dirty campers towards those who will follow them is inexcusable. Have they never heard of Leave No Trace? It’s not just bush camping that we find rubbish left behind, but as seen in this article from The Guardian, the problem is also in our local parks, where backpackers set up their camps. Plus, camping at Easter, seems to bring out the worst sort of campers. Not sure why, but assume that a lot of people who never camp at any other time of the year, start camping on this weekend. They have zero consideration for the environment. See this story about Easter campers on the River Murray. If you are new to camping, and not sure what you should do when you leave a campsite, here are 4 ideas you should incorporate into your camping trip! Not new? Then see if we have forgotten anything on this list! Campfires are a wonderful part of camping. Some people don’t even consider a camp trip unless they have one! Whilst they are wonderful to have, its very important that we leave the campsite only when they are fully extinguished. Some tips on how to put out a campfire properly are here. Leaving your rubbish in a campfire is a big NO. OMG. This is not rocket science to know this. Why do we keep coming across this at so many campsites? We came to a campsite in a National Park where obviously there had been a big drinking session by the last campers, and they had piled all their bottles in the firepit for us to dispose of. They hadn’t even bothered to try and burn them. Leave your campfire site, with nothing in it but ash when you leave. It is a campfire, not a waste bin. What you bring into your campsite, you need to take home with you. It isn’t fun having a big bag of smelly garbage in the back of your vehicle, but it is a necessary part of camping until you can find a bin to dispose of properly. If you don’t like the thought of having to cart out your rubbish when you leave and locate a bin, then camping is not for you. 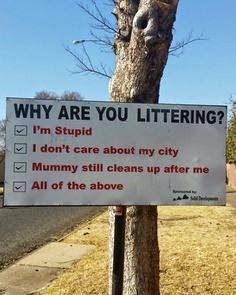 Don't like picking up your own mess? Then don't go camping. Stay in your backyard. Don’t try burying it either – animals will smell it, and dig it up, leaving rubbish strewn around the place. Cigarette butts are litter, so whilst they are small, these too, need correct disposal. This is part of point 2 mentioned above, but it’s worthy of its own special paragraph. Leaving food scraps in the campfire or on the ground can attract animals. You don’t want to feed the wildlife because of the behaviors that can be caused by them getting comfortable with human contact and ultimately, could endanger their safety. Leaving food on the ground means that animals could come to eat, but possibly ingest other items not suitable for them, including plastic ties etc. "The stark truth is, if we want wild animals, we have to make sacrifices." Organic matter like egg shells and nut shells, which don’t burn in a fire, should be taken home too. This could rate as the most unpleasant find at a campsite. We turned up at a Conservation Park and all the surrounding bush land had toilet paper throughout; dirty nappies left “hidden” and even toilet waste in a plastic shopping bag, hanging from trees. We had to move camp because we were concerned about young children stepping on crap. It may not be immediately evident upon arrival that this has happened, but a wander beyond the campsite will soon reveal it. If there are toilets, use them and leave them clean. Then you need to go well away from a campsite and water source. I mean well away, especially if it’s a poo. Dig a deep hole and then cover it completely. For more guidelines on how to go to take care of human waste the right way, Trailspace.com talks about this in more detail. If you are using a portable chemical toilet, the contents will turn to a slurry-like state thanks to the chemicals. If you can’t pour into a toilet (preferred method), or a dump point (another preferred choice) then you may have bury a long way from a campsite – but you need to still dig a deep hole and cover and disguise the hole afterwards. Don’t do this where some poor camper is likely to go for a stroll – well off trails please. The campers who do leave their campsites in a bad way are the probably the campers who won’t read this story. It’s a pity – they are the ones who need these reminders the most. If you are a beginner to camping, then start the right way and treat your campsite better than you would treat your home. For us that do the right thing when we go outdoors, continue to do so, and spread this information to everyone as a reminder (share now, via the buttons below).